Lyndon Ramsey is thankful for the opportunity to advance his career through the L.O.G.I.C. (Logistics, Operations, General Warehousing and Inventory Control) program at the Food Bank of Delaware. This workforce development program is part of Delaware Food Works, the Food Bank’s workforce development initiative, with training programs in warehousing, food service and agriculture. Lyndon and his class are working to become not only forklift certified, but also OSHA-10 certified. 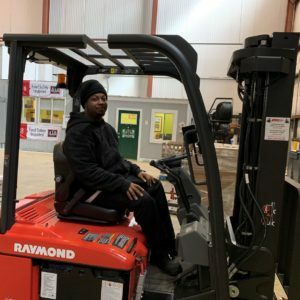 The warehouse industry is not new for this student, but after a year out of the workforce, Lyndon said the information has been a great refresher. He learned about the training program through Connections CSP. “I was looking for work… trying to find work. It wasn’t as easy, so I think this is the best choice for starting out for a better career,” he explained. In addition to providing a referral to the program, Connections also assists Lyndon with transportation to and from the program. Each day, the Connections van picks Lyndon up from his home and brings him to class. “It’s very convenient,” he said. The L.O.G.I.C. class splits time between the classroom and warehouse. Lyndon said the class has been reading from the warehouse management book and working on OSHA-1o computer modules. “We’ve been learning all of the different things that you wouldn’t learn hands on. It breaks everything down, like the different laws,” he said. Afternoons are spent doing hands-on work in the warehouse using equipment like pallet jacks, forklifts, end riders and order pickers. With Lyndon’s previous warehouse experience, he said the hands-on training has been a refresher. “It’s fun to get back into it,” he said. Upon graduation, he hopes to secure a “successful career.” He has already started applying and interviewing for jobs and is waiting to hear from several local employers. After a recent class field trip to the Walmart Distribution Center in Smyrna, Lyndon filled out an application and will hear about potential employment within a month. Five years from now, Lyndon hopes to be working to buy a house. Lyndon encourages others who are considering a career in the warehousing/logistics field to apply to L.OG.I.C. “Don’t think short-term, think long-term, because in the end it pays off,” he advised. Interested in a career in the warehousing/logistics industry? Click here to learn more about L.O.G.I.C. and apply online!